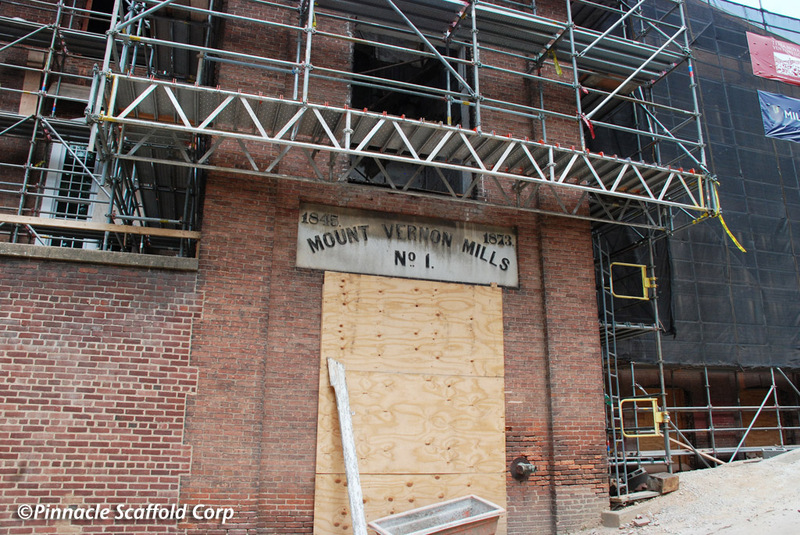 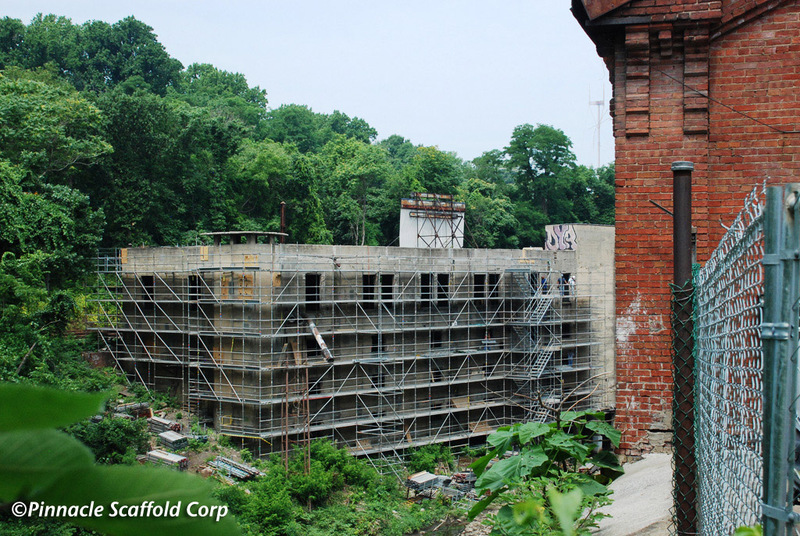 PSC (Pinnacle Scaffold) is proud to be a part of this $42 Million redevelopment of the century old Mt.Vernon Mill in Baltimore’s Jones Falls Valley that runs along the winding stretch of land between downtown and the Hampden neighborhood. 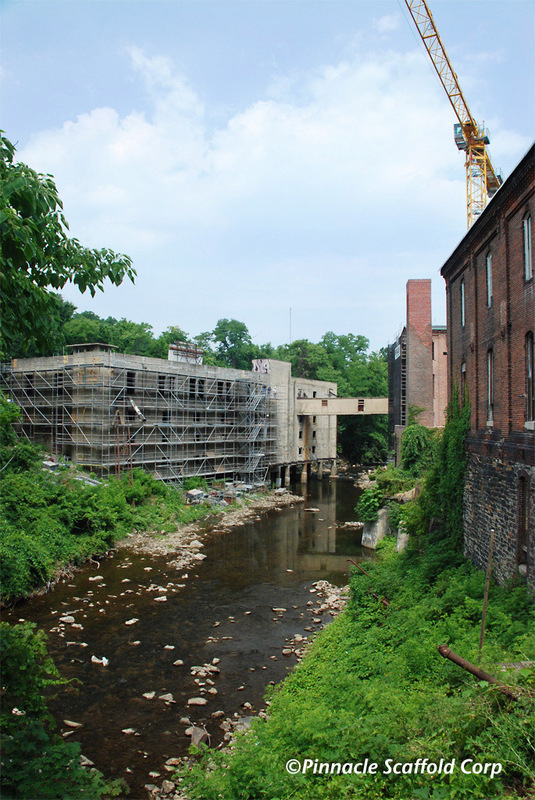 The 4 massive brick buildings straddle the Jones Falls stream along a third of a mile stretch of the Jones Falls. 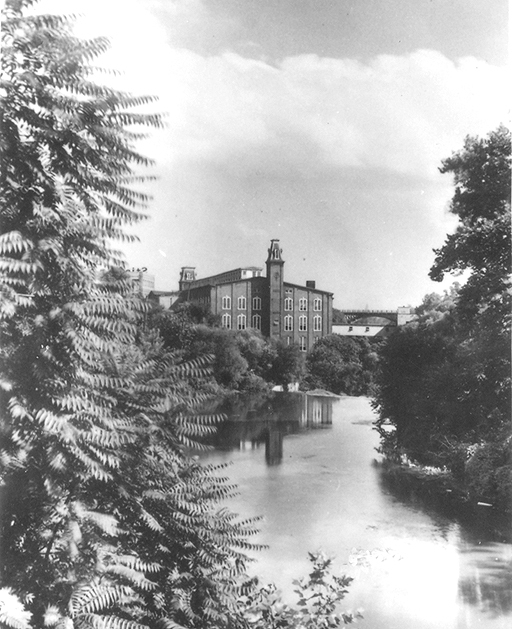 Construction of Mill No. 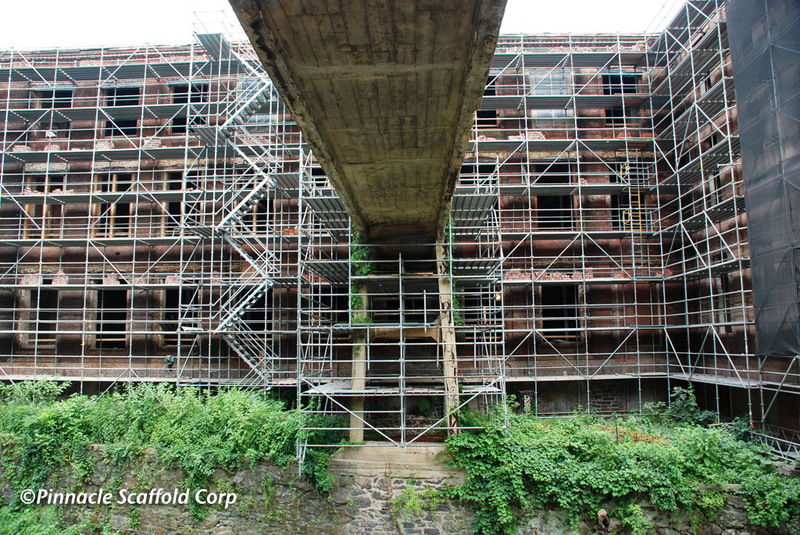 1 will be an adaptive reuse of the 19th Century cotton mill buildings into a mixed-use combination of office, retail, 93 apartments and two restaurants. 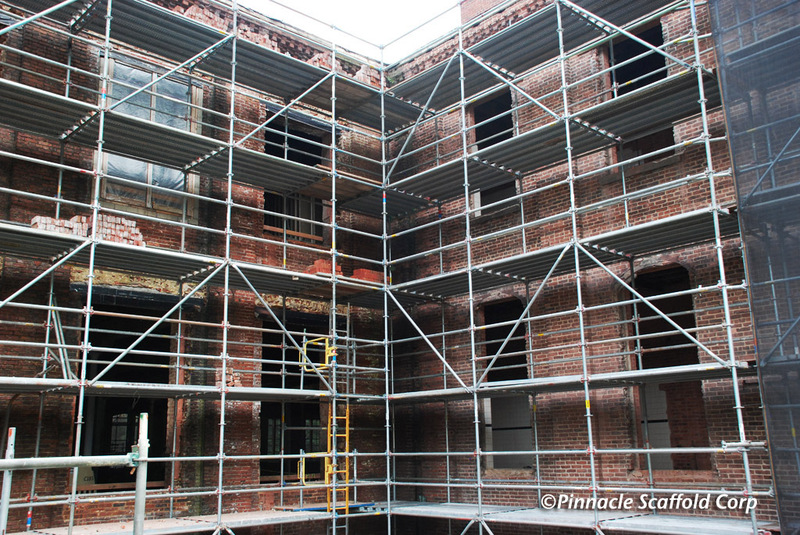 PSC beat out 3 or 4 large competitors for this giant revitalization project because the developer and general contractor trusted our ability to provide a budget conscious project with “out of the box solutions” to incredibly difficult scaffold challenges. 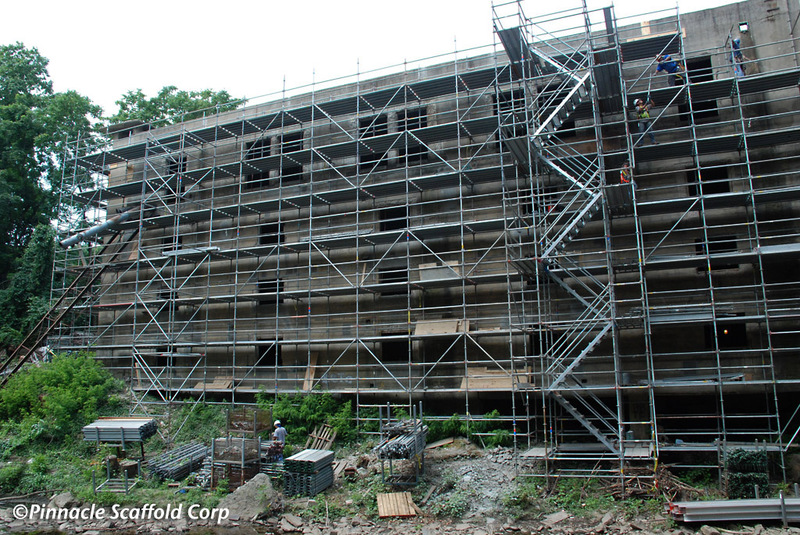 The entire job was a giant obstacle/challenge from the steep driveways and access points to the over the water scaffolding necessary to complete the work. 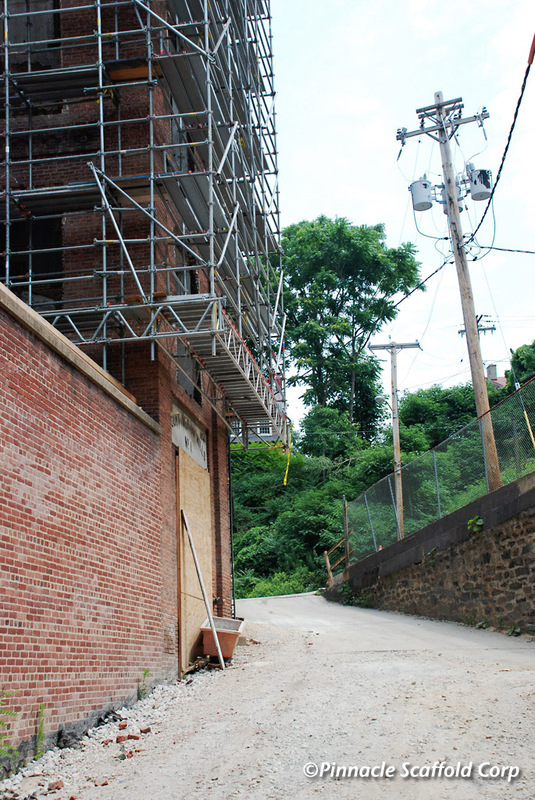 It’s safe to say that this is one of PSC’s greatest achievements to date. 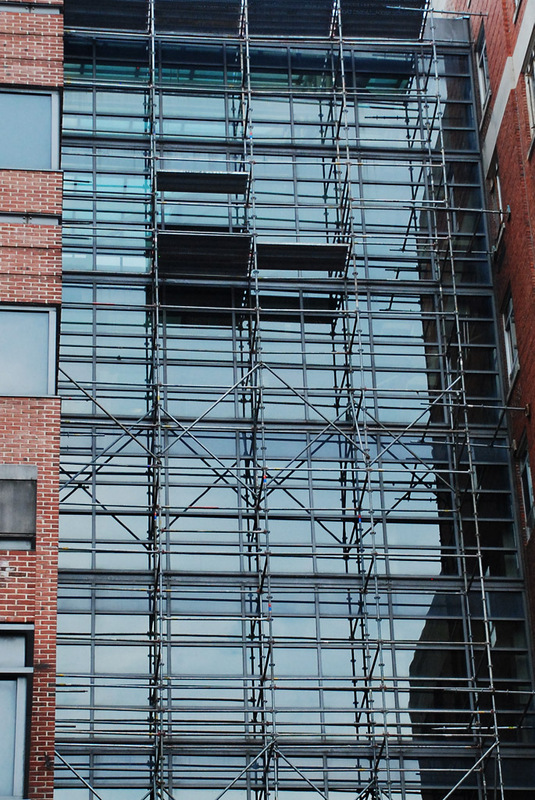 Just look at the pictures and you can see the challenges that we had to overcome providing top-notch work with incredible built-in safety precautions. 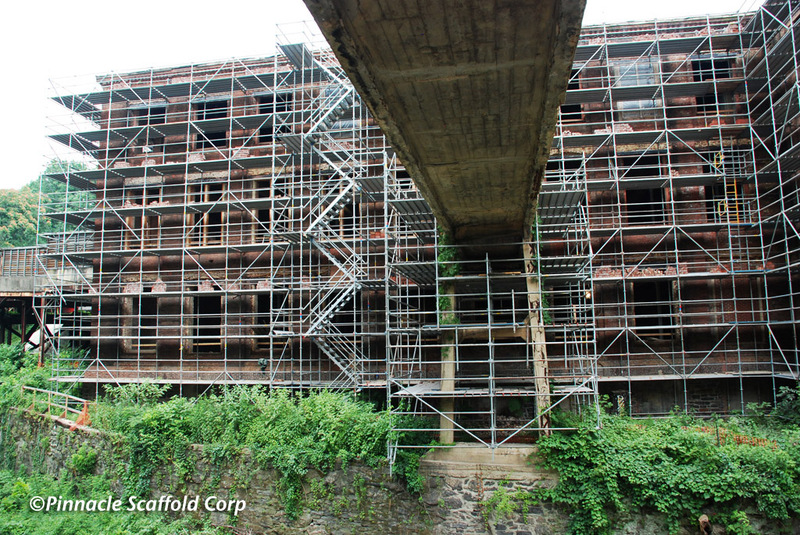 First on the list are the special brackets that we had to manufacture for the job to hold the cantilevered trusses out and over the water that in turn would support the entire scaffold ABOVE the water so workers could get access to the façade and roof for restoration, repointing and rebuilding. 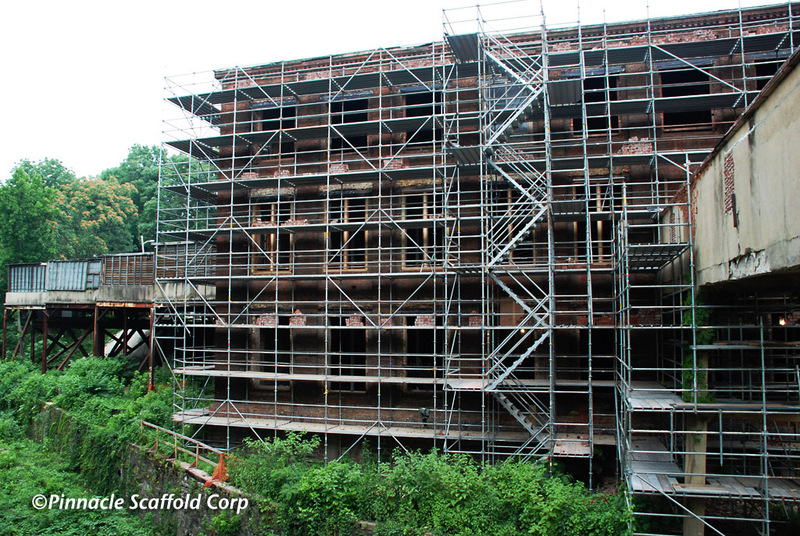 The second large challenge was to provide scaffolding around the entire building WITHOUT blocking access roads and driveways. 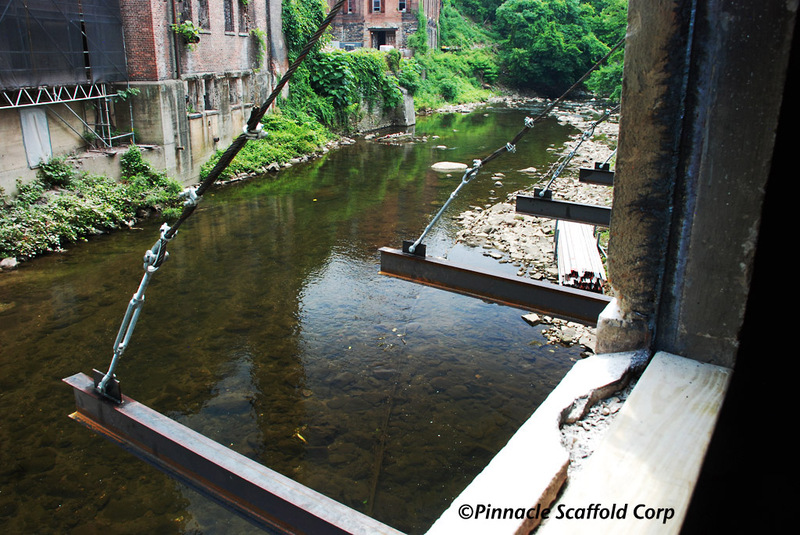 PSC had to design special cantilevered trusses over the main access driveway to keep the road open and the workers access to the building repairs. 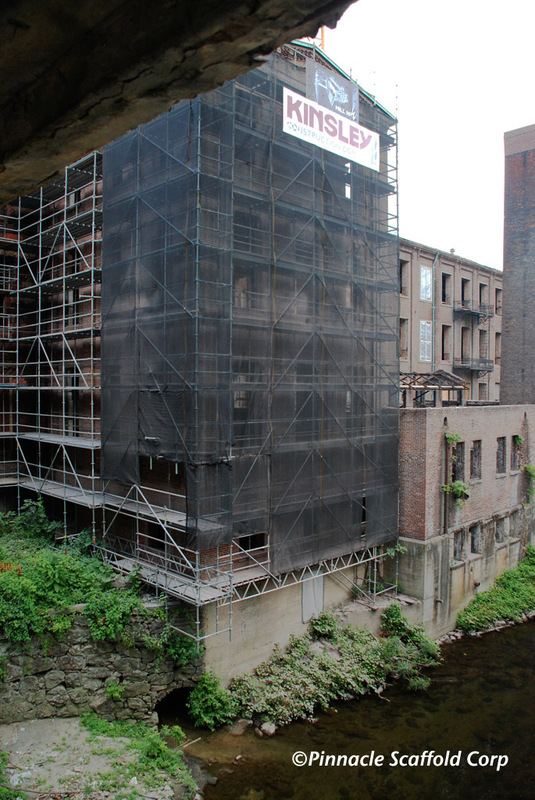 Third, the developer Terra Nova Ventures plans to transform this site with a strong focus on the environment. 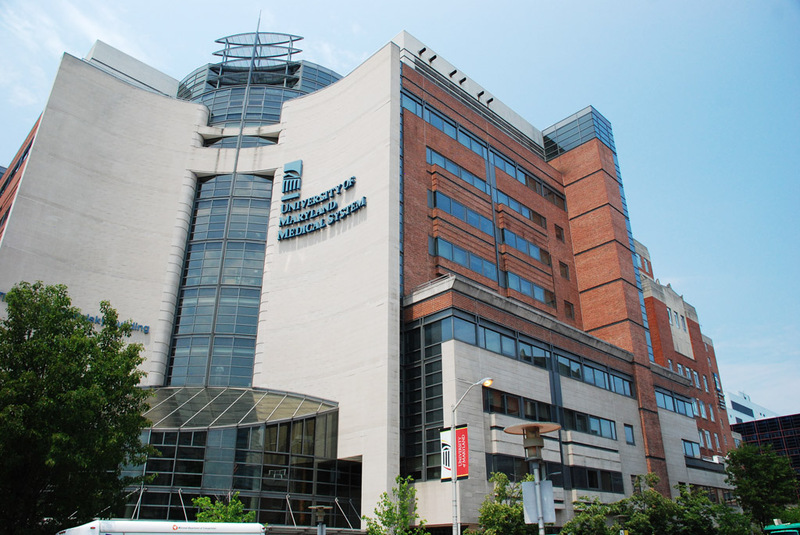 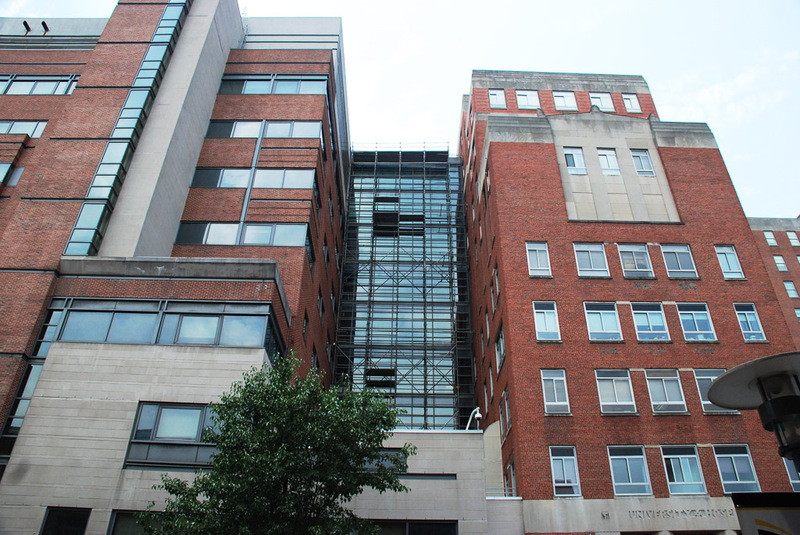 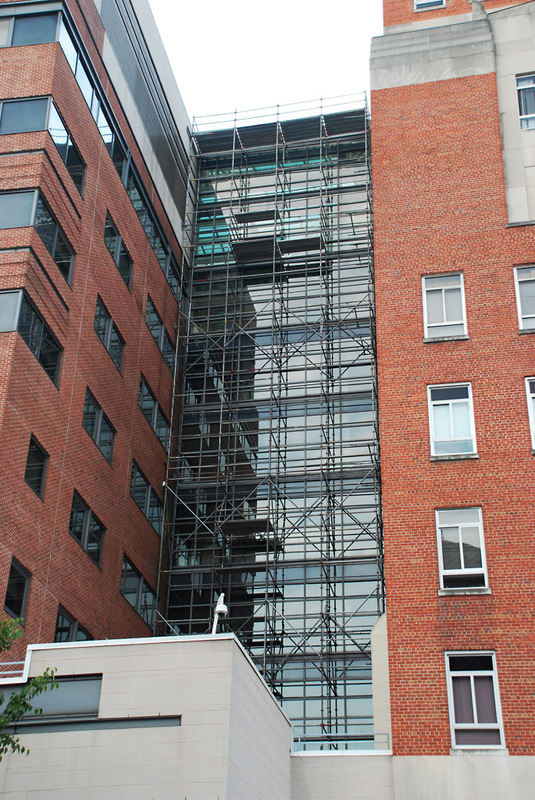 So PSC took a careful approach to meet Baltimore green building standards. 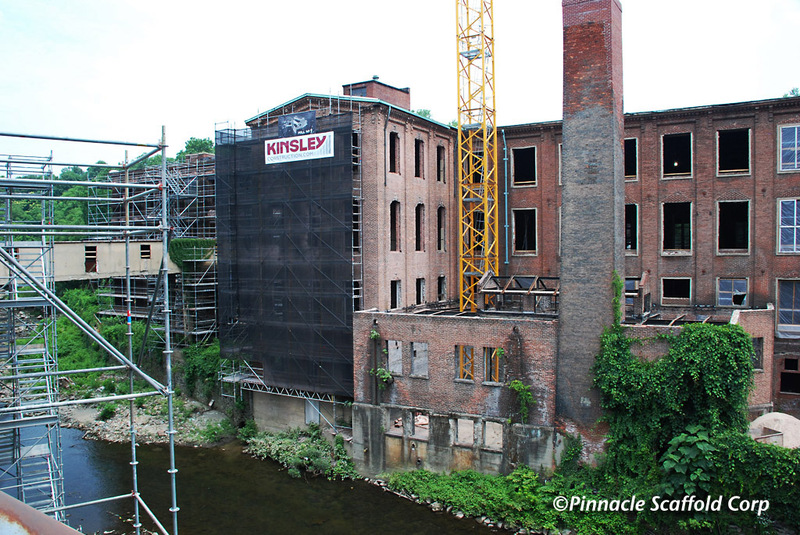 Soon the century old brick and stone cotton mill be brought into the 21st century. 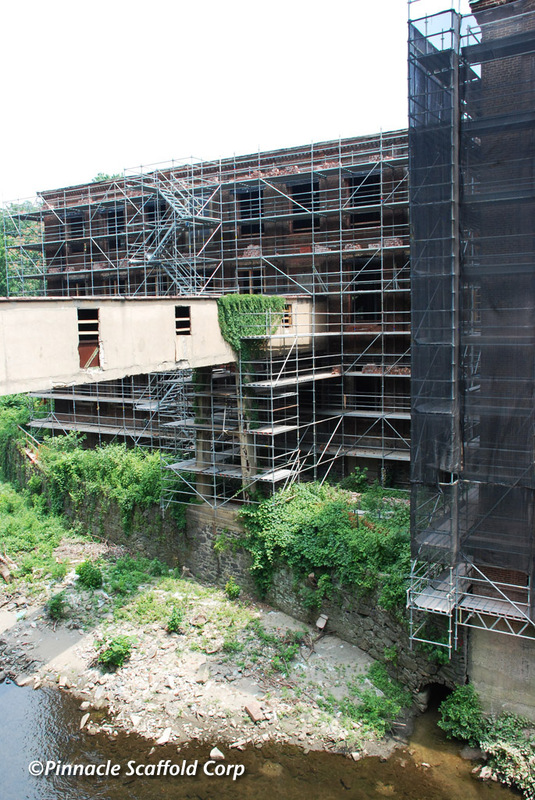 The rehabilitation of the Mt. 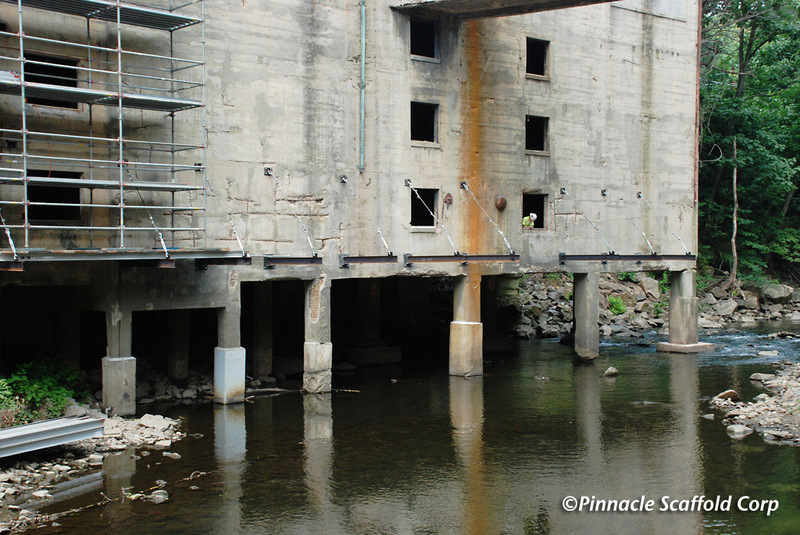 Vernon Mill project has begun and PSC is proud to be a part of it. 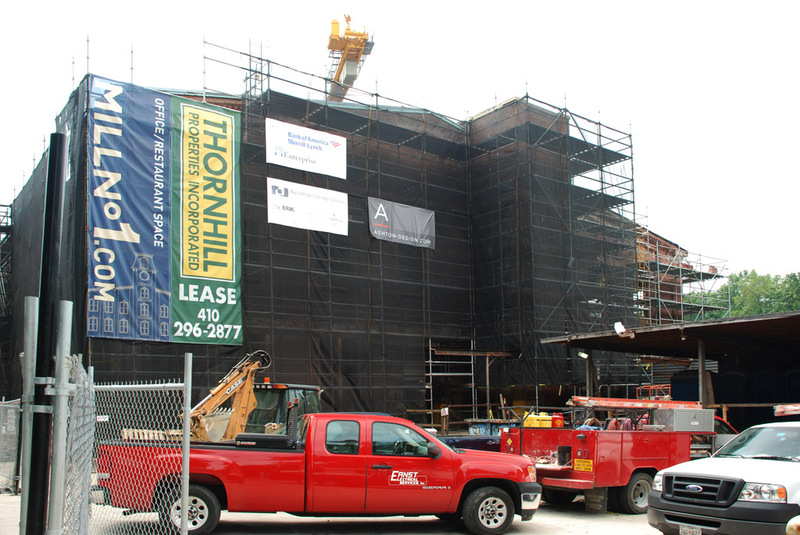 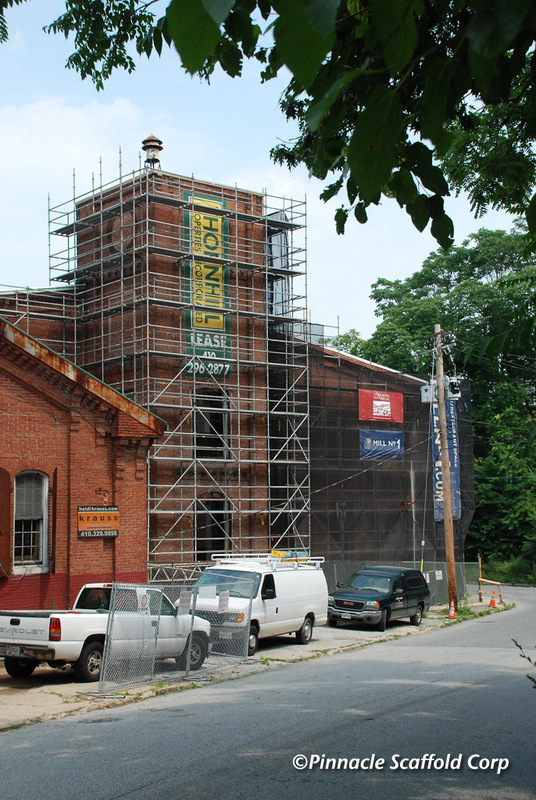 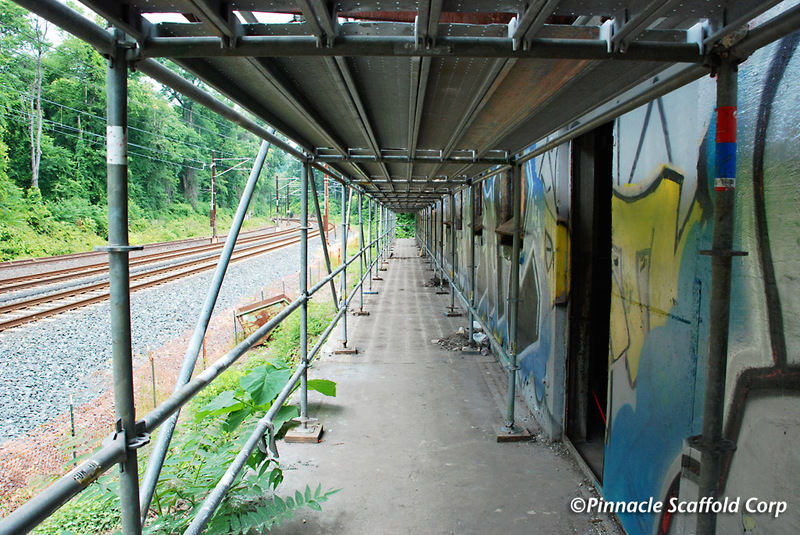 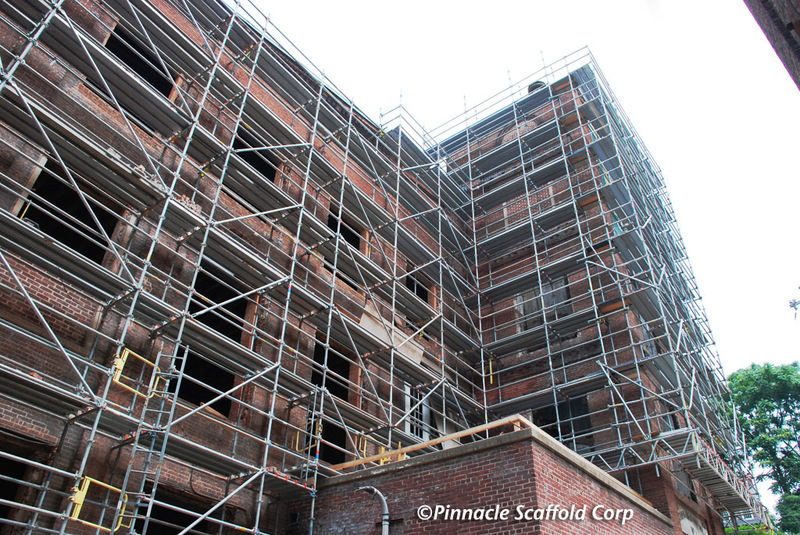 Call Pinnacle Scaffold today at (302) 766-5322 or visit http://www.pinnaclescaffold.com.